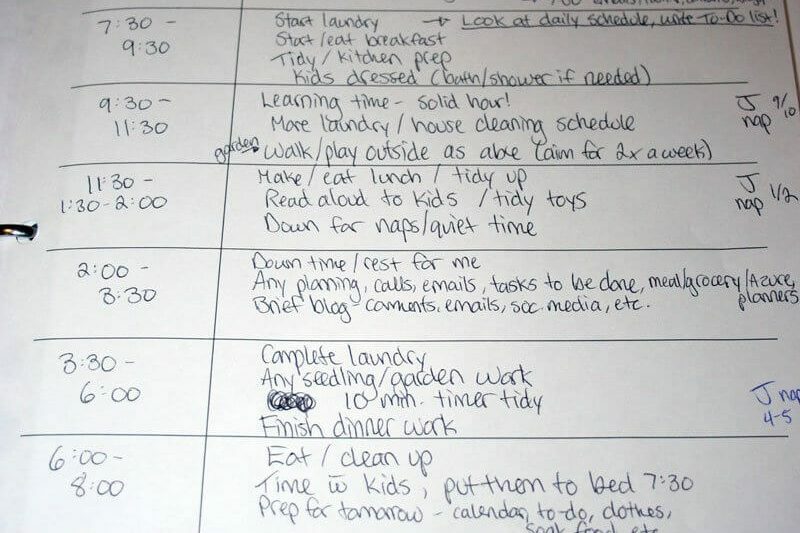 You are here: Home » Blog » Homemaking » Your Turn to Get Organized with a Meal ePlanner! My newest daily routine which I am still working to fully implement! Your Turn to Get Organized with a Meal ePlanner! As requested, here are the closeups of some of the pages from my homemaking binder. 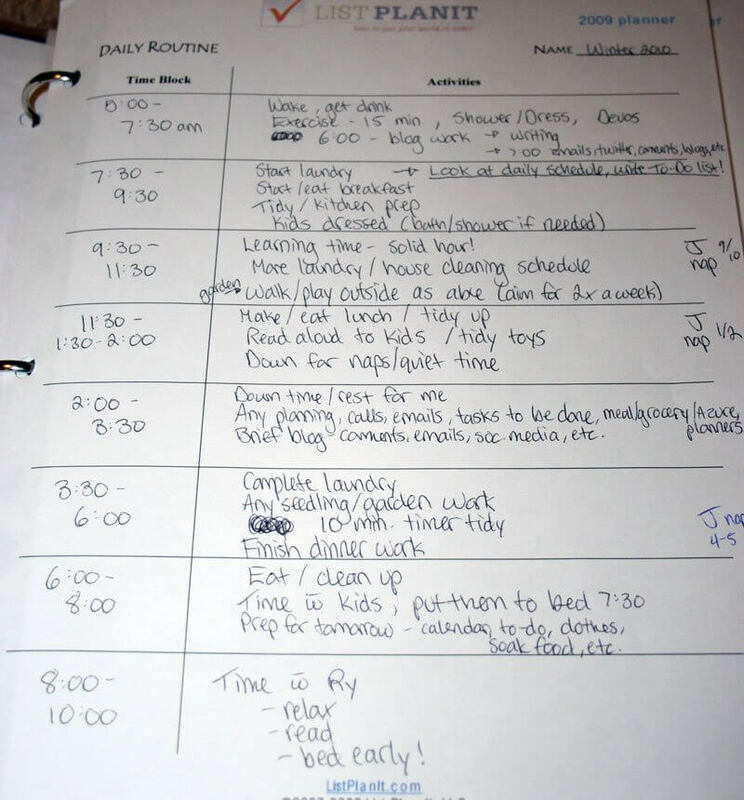 Believe me, if you’re looking for someone’s routines and schedules to emulate, mine probably aren’t the right ones! Organizing is something I strive for, but not necessarily something I always achieve. And please always remember that when I share things like this, this is just me. Just my family, our season of life, our preferences, etc. It shouldn’t tell you the “right” way to organize your own home or time, because there is no right way. Just seek the Lord and do your best to figure out how you can serve your family best! I promised a while back that I would be giving you access to a few of the meal planning pages from ListPlanIt, so here they are! Each of these pages is included in a ListPlanIt membership, but this is just a little sampling to give you a taste of how helpful they are! Just look for the “Print” option near the top of each page to print off as many of your own as you would like. Thanks, Jennifer, for making these available! This time it’s a Meal ePlanner. Actually, 2 Meal ePlanners, to be more precise! What exactly is a Meal ePlanner you ask? It’s sort of like having a ListPlanIt membership, but with a focus on just one area… meals planning and kitchen organization. It functions similarly to an eBook, in that you download it and can print off any or all parts of it as you wish. It includes a brief intro to how to you it and some of the particular pages within. Then it gives you 17 different pages to assist you in making your meal planning come together easier. 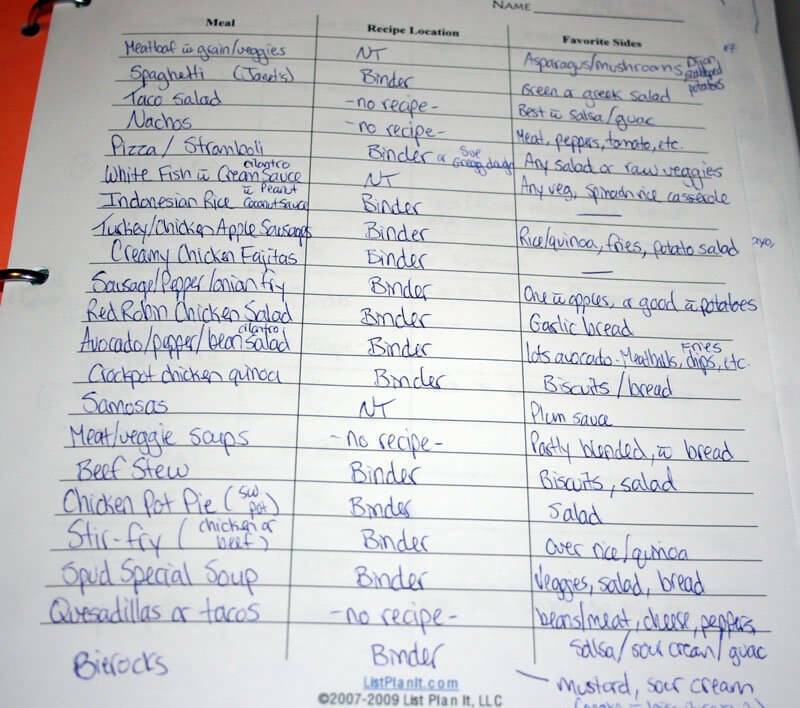 Lists like the 21 meals shown above, both monthly and weekly meal planners, grocery shopping lists, meal inventories, recipe card pages, and even a measurement equivalents page (no more running to the computer to pull up a measurement conversion website!). Though I really prefer having the full membership to be able to access all of the lists available, having an ePlanner gives you a taste of what there is and enough specific lists to help you get organized in a particular area, without the cost of the year long membership, since ePlanners cost a mere $4.95. They’re available for each category included in a ListPlanIt membership, allowing you to just purchase a few that interest you most (although if you’re going to buy several, you might want to consider just purchasing a membership to give yourself full access to everything). Who wants to win a Meal ePlanner? Leave a comment telling me why you need this Meal ePlanner! Giveaway will end Monday, February 1 at 3:00pm. This giveaway has now ended- winners to be announced shortly! .-= alexis´s last blog ..Super-Simple Salad Dressings =-. I need this meal planner because I find myself wasting way too much time going back and forth to the grocery store during the week. I find I buy the staple items for dinners, such as meat, vegetables, and some kind of starch…but then when i pull out a recipe that I want to make I am always missing one or two items. I think having menu planning tools would help me to save the money of going to the store way too many times. If I was going to choose another eplanner besides the menu one it would be the planner eplanner. I have two girls and the older one is now 2 1/2 yr. old and I am really trying to get this whole stay at home mom thing down. I feel like all the planners would help me to get thru my day and have something to show for it. I work in the evenings and want to have a cleaner house when I have to leave. I need this meal planner because I’m still scribbling in my day planner of what we will eat for the week. I need this meal eplanner because we are trying to cut our budget and planning our meals will save money so that we aren’t running out to eat on days I didn’t plan ahead for. 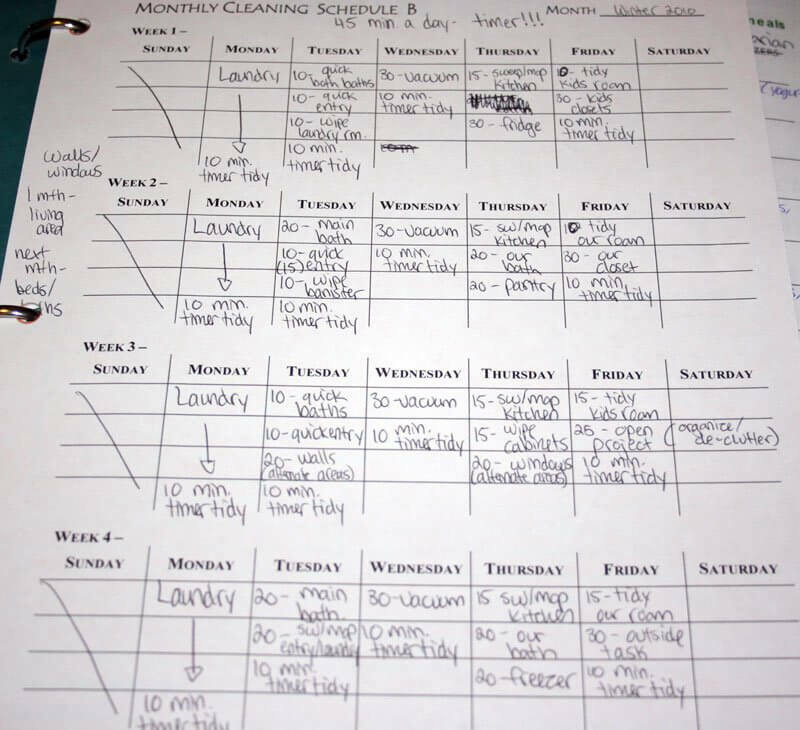 I would love the home planner to plan out more schedules for cleaning etc. I looked through the eplanners and I would love the Home ePlanner – what a wonderful resource to help me pull it all together! Boy, do I need this planner. Not always consistent with meal planning mainly because it is intimidating when sitting down to plan. A clear direction would certainly help. Looking through the eplanners, I think I would be most interested in the financial planner. Already subscribe and get emails. I could definitely use the meal planner. Baby 4 was born in December and meal planning has been horrible! I could really use some help! I already subscribe via Google Reader! .-= Jennifer´s last blog ..Birthday Boy =-. I could really use this meal planner. Between homeschooling a 15 year old, and a 10 year old, and chasing around my 2 year old, things get pretty hectic around here. On top of that, there is all the housework, and I am a full time college student as well, with 5 classes this semester. I need help. It would help me out to have a menu set up and ready to go. I need this planner because my husband has been begging for a meal rotation and I just can’t get it together!! He’d be the happiest guy around if he saw some organization in what I cooked! If I were to chose another planner, it would be a toss up between the home planner, and the student planner. I’d definitely put the financial and contacts eplanners to use. I am constantly searching for my addresses and my hubby and I just started a budget last week. I need this eplanner b/c I always start meal planning, but get distracted and don’t follow through. My “plans” are always on lose sheets of paper and are different week to week, so there is no cohesiveness. The home planner sounds like it would be great too! I need a meal planner because I’m hopelessly disorganized! I have four children, and need to get a schedule down for us, and meal plans in place! I really like the thought of the finance eplanner. My meal planning has been so unorganized lately because we have different food allergies that keep popping up. The meal planner would help me figure it all out! My first pick would be the Home ePlanner. I need this because I have no plan yet! My twins are just getting old enough to where I feel like I could make plans to cook on a more regular basis. .-= Lee´s last blog ..Supermom (Cape not included) =-. I need this planner because my current method of planning meals needs to be streamlined. .-= Christine´s last blog ..35 Weeks and Good News! =-. I would love to own the Home eplanner. I’m following GAPS diet and my husband is not. So, I’m cooking a lot and this would be really helpful. I’m making my own meal plan right now, but winning this would really accelerate the process I think! Thanks! I love lists–and I have made a summer/winter inventory of all our seasonal meals when you first talked about sharing these lists with us–so I am ready to print out & write up!! Thanks for sharing. I love lists, and I will even write things on them I just did, just so I can cross them off, lol!! .-= Sarah M´s last blog .."New House" Home Blog Tour =-. I looked through their eplanners and LOVED the Home, Memories, and MOVING ones!! Great! I love these lists–thanks for letting us print some out!! I love these lists–thanks for letting us print some out! I need this meal planner b/c I am new to menu planning & very disorganized! i am now following listplanit on twitter! Love new methods of organization. Seems to give that boost when I’m in a rut! Thanks for a great give-away! contacts eplanner would be my 1st pick. I just had to scramble to find addresses for my contacts gere, there, & everywhere. My contacts are in disarray & need to be organized in one place! I need the meal planner because my current system is really inefficient. It’s working fine now, as I only have one child, but with more kids and more stuff to take care of, it won’t work unless I give it a good overhaul, and this would really help! If I had my choice of e-planners, I’d go with the moving one, because we have a big move coming up, and I think it’d be really helpful. Thanks! I would love the ePlanner because I am totally new to the whole meal planning thing and need a little hand holding! I know it would save us time and money but sometimes it seems so overwhelming to even know where to start. The other ePlanner I really like is the Planner planner. Besides the name…..I love the calenders and the daily schedules. I think this would be a lot more useful than scraps of paper with to-do lists scribbled on them all over my house! I think the home planner would be really great! i would love to win! I have been trying to get my act together before baby #3 arrives in May! because i always love to try new meals but forget about our old favourites when we get in a new groove! Why I need this planner: 5 very small very hungry children, including a newborn and a hungry husband! More for my sanity and knowing what is for dinner, what needs to be done and our budget would thank me for it too. Thanks for the entry! Wow, what nice eplanners! I think that I would most benefit from the Home eplanner. Thank you for the giveaway and entry. I subscribe to your blog. Thank you for the entry. I subscribe to Jennifer’s blog/newsletter. Thank you for the entry! I am trying to serve more real food and it really changes my budget. I’d like to have this meal planner to really think through my meals ahead of time and reduce some of the costs that come up when I don’t plan. the Financial ePlanner would definitely be my next pick! I need this meal planner because I am the mother of 4 with 1 on the way. There are many other reasons but that says it all right there! .-= Lindsay Downs´s last blog ..These Are Sweet =-. The Home ePlanner would be my other choice! I would love to win this because with 4 children ages 4 and under, I struggle with organization. And when meal planning doesn’t come together, nothing does! Would love to try out this system. My next favorite choice would be the Home planner. And I subscribe to your blog. I subscribe to your blog! I could really use a meal planner, because I’m trying to get organized (again) with 2 young children while staying within our budget! .-= Amy´s last blog ..My Identity In Christ =-. I would love a copy of this eplanner because I have just begun to organize my recipes and make a kitchen notebook. This would be a big help. I looked at the eplanners and my favorite (besides the meals) would be the memories planner. I subscribe to your blog on bloglines. I would love a better system so I’m not runnin around looking for the recipe at dinnertime. .-= Katie @ Kitchen Stewardship´s last blog ..How to Feed a Husband Real Food =-. I’d love this organizing system because I am an organizing junkie! I think I ‘d like the housecleaning list since that is my weakest area. I follow Jennifer on Twitter. I would use the Planner eplanner! I need a meal planner because come 5:00 I’m staring into the refridgerator and the cabinets looking for what we are going to have for supper. I need something that will keep me organized and that I’ll know what I’m having for what days and what I’ll need for those days. I think my top pick would be the financial planner. We are striving this year to be more financial frugal and staying on top of a budget. I subscribed to Jennifer’s blog. I need this planner because I’ve all but given up planning out meals, which doesn’t work when you’re trying to save money! .-= Jenny´s last blog ..Daycare Christmas Party =-. Other than than the meal planner I would love the family matters planner. It looks like there are a lot of good ideas there! I’m just starting to do meal planning so this would be great! I’d also love the financial eplanner. We all are great purchasers and buy plenty of stuff in our everyday life. And there are two main groups of expenses: things we really need and things we enjoy. That is we need dwelling, education and medical help and we enjoy eating out, movies and holidays. And being a part of a civilization founded on consuming, we often need some professional help to manage our finance without trouble and nervous breakdowns.